Before reading, I asked the kids if they recognized the illustrations in the book. Elli said the one with the tree reminded her of "the story of the bull." So (happy that she made that connection), I pulled out The Story of Ferdinand and explained that they had the same author and illustrator. I really liked this book - enough that I ordered it to add to our FIAR collection. I especially like how amiable Wee Gillis is, but it could have been because it brought up good discussion and that we enjoyed the story and our row. Along with the lessons from the manual, we. . .
Found Scotland, Highlands, and Lowlands on a map from World Atlas (see map below). Read Always Room for One More, a Caldecott winner that I found in the Country/Scotland section in Children's Literature at the library. The book is a sing-song story derived from an old Scottish nursery tale. Lachie MacLachlan, the generous hero of this enchanting tale, is the exception to the rule that the Scots are a thrifty lot. In his "wee house in the heather," where he lives with his family of twelve, he welcomes to his hearth every weary traveler who passes by on a stormy night. "There's always room for one more," says Lachie, and how his grateful guests say a wonderful "Thank you" provides a delightfully warm and tender ending to this hilarious tale of kindness. Listened to bagpipe music with a sense of humor. The conflict in the duel reminds me of Wee Gillis. :) Then I printed a picture of bagpipes for our album (see below). 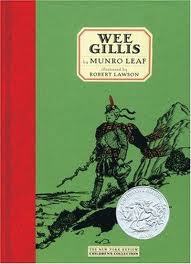 Malachi's narration was as long-winded as Wee Gillis' could have been (see below). Here is Eliana's narration. 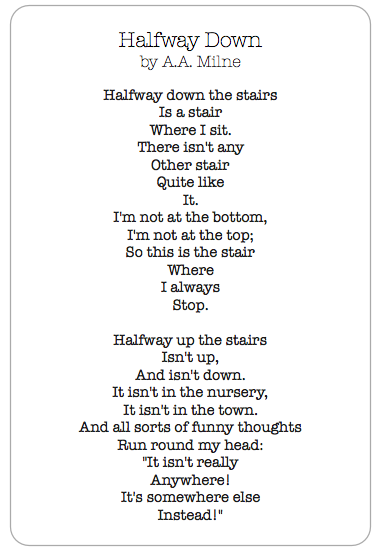 . .
Read Halfway Down, by A.A. Milne. This poem came to mind our first day of the row, so I read it to Mali and Elli. . . (I like this poem). To go along with the lessons in the manual, we did activities from Usborne Book of Science Activities Volume 2 (pp. 18-19 Breathing Air) & Volume 3 (Breathing pp36-37) and an experiment from Exploring Creation with Astronomy. Wee Gillis has very strong lungs from calling the cows and holding his breath while stalking stags. We blew as hard as we could to empty the water out of the bottle to see how much air we can breathe. How much air can you breathe? Then we made a breathing model to demonstrate how our lungs work. We learned that sound is made when something vibrates. 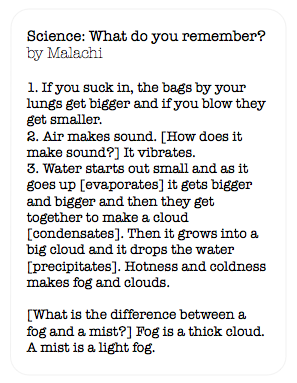 We read from Volume 3: Clouds, Rain and Fog pp. 54-55. I was getting ready to do another experiment, but Dylan showed me this one from the Astronomy book. . . So, I had him do the experiment with the kids. It is actually an experiment to demonstrate why there are clouds on planets, but it made a neat cloud. Lessons from the manual. . .
Cross-hatching with scratch-art paper ~ thanks, Abby! From Malachi's Singapore 1B Math. Did calendar pages from 1+1+1=1's Daily Calendar Notebook and sang the Months of the Year song. Proverbs 9:9 - Instruct a wise man and he will be wiser still. Micah 6:8 - He has shown you O man, what is good: And what does YHVH require of you: But to do justly, love mercy and walk humbly with your God? Lesson from the Christian Character and Bible Study Supplement, p. 33. Our focus was on the fact that Wee Gillis has a teachable spirit and humbly receives correction and instruction. We used examples from the story and real life. We had overnight oatmeal (in a "big" bowl) one morning. And for our FI♥AR treat, we had Scottish Shortbread. Totally posing for a pic. Malachi's narration on a 6x12 insert. I am having fun with our Project Life pages for school, but I am working on simplifying my pages AND my rows so that they are still special, wonderful and memorable, but easier to document. It is just so hard to not include every little detail (or do everything I want to do), but I can't keep this up. Life is just too full right now. Wee Gillis is a Five in a Row selection from Volume 2. We rowed this during Week 12 of our life. That was 4 weeks ago! Still coming up: Sonlight Moments ~ Core P4/5 and our row of Mr. Gumpy's Motor Car. Currently rowing: Make Way For Ducklings. Also in the works is a review of Elizabeth Pantley's No-Cry Solution books. I'm reviewing the No-Cry Discipline, No-Cry Nap, and No-Cry Picky Eater Solution books. I read the No-Cry Sleep Solution before and so far, I continue to love how practical Elizabeth's books are! After that, we will row All Those Secrets of the World followed by Follow the Drinking Gourd, and then we are done with Volume 2! I will look forward to rowing Volume 3 after a nice, long break! Wee Gillis Inspiration @ A House of. . .